To better understand Lemelson’s focus on invention education, and why the Amgen Foundation is committed to giving every child the opportunity to engage in and succeed in science – check out this important op-ed from 2017 on the Lost Einsteins among us. LabXchange, our new initiative with Harvard, is one more piece of the puzzle to addressing some of the inequities described in the article, inequities that can shape who is prepared to enter the lab and a scientific career. My take-away from the many sessions I participated in today is that everyone is coming at the same issue from many different angles and approaches; namely, how do we prepare the next generation for success in career and citizenship when it’s not clear what the future will look like? Some talk of workforce development, others of STEM education; some focus on the great disparities in opportunities within the U.S., others take a global view of where we are as a society or a country; and some focus on technology as the problem, others as the solution. It’s good to see that blended learning or hybrid experiences are being discussed quite a bit here, where we take what works in the classroom and combine it with what works online. That way it’s not an either/or proposition where one way is the way. That silver bullet doesn’t exist and never has. Building Community: Weaving America’s Social Fabric: David Brooks of the Aspen Institute and others. One of his take-away's: all of us, regardless of the many things that divide us, care about our kids. Could education be what brings us together? Separate sessions on Building Equitable Education Ecosystems, as well as Low-Income & First Gen College Students discussed a growth mindset and utilizing an asset-based (or strength-based) approach in education versus a deficit model. This article about Who Gets to Graduate (College) in the U.S. was a topic of discussion. Later in the afternoon, Google discussed EdTech, Gates and Chan Zuckerberg discussed the learning sciences as it relates to EdTech, and finally a different panel focused on What’s Driving K-12 Innovation. That one ended with one panelist proclaiming it’s not about predicting the future, it’s about inventing it. Which is a nice wrap for tomorrow’s panel. That was just seven of what must have been 100 separate events today. Looking forward to tomorrow. Similar to my recap of the first day, I’m just going to touch on a handful of highlights besides the panel. I can’t be the only one who wishes they could be in multiple places at the same time here at South by Southwest Edu, nor the first to note that the discussion outside the talks can be just as animating as that in. It was great to participate on the panel discussion around a new paradigm for preparing tomorrow’s workforce. Kudos to the Lemelson Foundation for all they are doing around invention education, as exemplified by the Lemelson-MIT partnership and the all-star teacher who sat next to me on the panel. 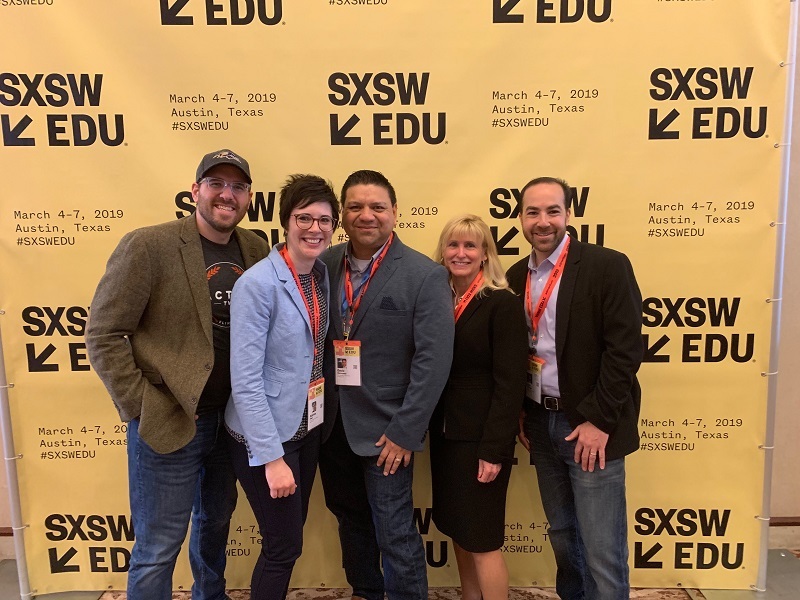 These educators exist in every community; while we can’t clone them, we can certainly give them as loud a megaphone as possible and hope to learn from the approach, expertise, and passion they bring to teaching our students. The panel was a thoughtful discussion on a new framework to – at its heart – untap more potential across this country (and the world). It’s ridiculous how much talent we’re leaving on the sidelines, not just for their sake but for ours. I again touched on LabXchange as a new and potentially powerful tool and platform to prepare more students for science, for invention, and for careers. I also touched on the importance of failure to learning and innovation, something Harvard and the Amgen Foundation are ensuring will be allowed over and over on the new platform. Last, the panel discussed resilience, which is a characteristic a scientist I know pointed out once when she was asked the most important trait one could have for a career in research. A separate panel on how the World of School is Preparing for the World of Work also touched on the importance of empathy, as well as how we’ve moving from a world where you follow directions at your job to one where you need to take ownership and literally create the value you add. The conversation that followed is then how schools and society can best support and empower youth with the agency, ownership and drive to best do this – as well as with older workers who may need to adopt a new approach and skillset that’s relevant for their local context. This shift in mindset – that the latest research from the National Academies shows is best brought about out when educators facilitate learning instead of dispense information – is critical to building that sense of ownership that can lead to greater life-long learning and citizenship. 100Kin10 is another organization that is advancing teaching and learning in systemic ways across our education system, and we’re proud to be one of their partners. One talk that really stands out to me, even though there were plenty of others on EdTech, diversity equity and inclusion, and educational innovations of all sorts in science and beyond is yesterday’s keynote by Patrick Awuha. Patrick left Ghana as a teenager, worked for Microsoft, and then returned to Ghana to found Ashesi University. He is the definition of leadership, transparency, and honesty. A remarkable talk from a remarkable man (this talk is from TED). He shared a number of things, including how Asia was poorer than Africa a few decades ago, and how Africa’s population will double in the coming decades. He’s a true leader in every sense of the word, and he’s showing that one Commencement at a time. No kidding that it was thought-provoking just stopping to get a hot chocolate between talks, which shows how conference organizers can make a difference not just through the agenda. I was served by an individual with a physical disability at a regular coffee shop inside the convention center. You had to look closely, but I noticed some of the other staff may or may not have had a disability; and standing off to the side of the coffee shop was an individual wearing a shirt for Beyond Differences. Though I wasn’t able to attend, note that this nonprofit spoke at the conference about their national No One Eats Alone school lunch program. To live is to choose. But to choose well, you have to know who you are and what you stand for, where you want to go and why you want to get there. In our desire to prepare children for the future – for careers that don’t yet exist – we can’t lose sight of the why.